Trying to maintain at least some shreds of sanity when you're traveling with kids on long plane trips isn't always easy, and there are definitely times when my kids have tested the limits of my ingenuity and patience during our travels. I recently read an excellent post titled Preventing Travel Meltdowns: Golden Rules for Family Travel by Candace Stapen at FamilyiTrips which has some excellent advice and tips. Tip #7, "Have a sense of humor", stood out to me as the key to success. It's not as easy as it sounds to have a sense of humor when you're sleep deprived and traveling with sleep deprived children, but it really does help. Here are my 5 tips on how to keep that sense of humor alive when, for example, your children are going nuts, crying, throwing a tantrum at the gate, balking at walking another foot, or when they're so bored with the long flight that they just can't contain themselves. 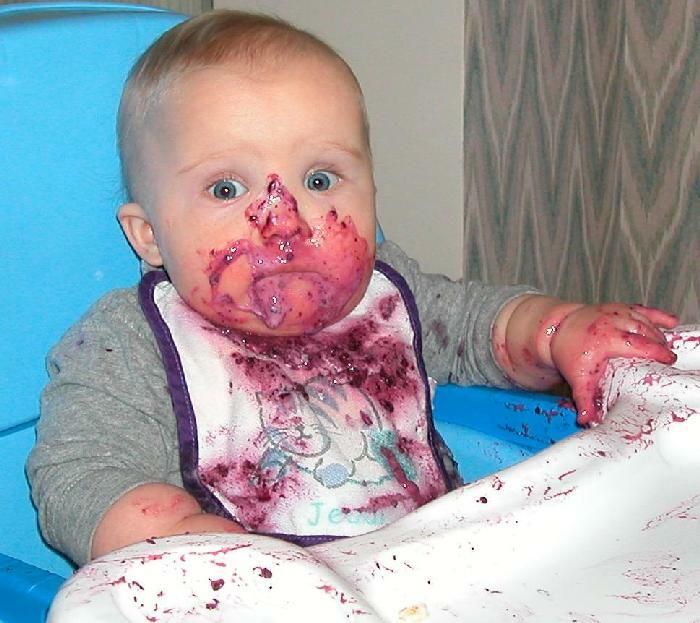 "When you were a baby and ate blueberries for the first time..."
Funny baby stories are a parent's secret weapon. My 4 and 8 year old are totally fascinated by any tale that is about them, and involves what they did as a baby (as teens, their reactions will probably be somewhat different...). Stories like "When you were a baby you would..." can catch their attention and even head off a tantrum at times. I usually try to tie the stories into whatever is going on, for example"When you were a baby and you were really tired, you would just cry and cry and cry like this", followed by an imitation of a crying baby, and then more colorful, embroidered details. It usually makes the kids laugh, or at least improves their mood. I do have a thing for puppets, simply I think they are one of the most brilliant kids' toys ever. They are fun for you to use and play around and goof with your child, and they are also fun for your child to use and make up stories and games. A definite winner for many age groups. This usually works well on my 8 year old son if he's grumpy and refuses to do something he has to do (like wait in line at security) or wants to do something he knows is impossible (getting off the plane in mid-air for example). I will start suggesting crazy things we could do, like go for a walk on the wing, ride on top of the airplane, hold on to the tail of the airplane, and so on. The crazier the suggestions I bring up the better: somewhere along the line he'll start cracking up, or tell me "mommyyyyy, you can't do that!". I'm usually a pretty sedate and laid-back person, or so I like to tell myself. I'm not one of those moms who do goofy, funny things all the time anyway. But if my kids are in tantrum-territory on a plane or in an airport, or they're just tired of the whole traveling process, it sometimes helps to do something they're not expecting. Running through the airport corridors for example, skipping instead of walking, singing a silly song, pretending to be a dinosaur: all these things can help make things more fun for your kids and for you. T-rexes really do have more fun! There are times when my tired, bored kids can turn into really, really silly kids. This is especially true of my 4 year old daughter who is the master of appearing goofy and giggly when she's actually exhausted. When she's in that kind of mood, she often ends up going a bit over the top with her running, skipping, talking, and general silliness level. That's not always easy to deal with when we're traveling, but I find that allowing some of that energy to come out, and even playing along with it, can be better than trying to stop it all together. Sitting still and being quiet for an entire 20 hour trip just isn't feasible for all kids. Is the behavior damaging property, or hurting her or someone else? Because then it obviously has to stop. Is she driving other people insane, or just me? If it's just me, then I'll chalk it up to my own parental control-freakishness, try to relax, smile and let her do her thing. In conclusion: Laughter really can be the best travel-medicine, whether you're traveling for long or short distances, so remember to bring some of it with you when you go!